Ryuou Arai is the new President of the Kin’ou School of Dance in Tokyo, an establishment which has been in his family for generations. On 17th November 2014 he kicked off his UK Tour in Oxford. 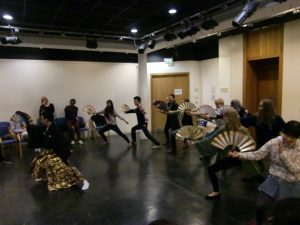 One of the main aims of the tour is to raise the profile of Japanese traditional arts and culture outside of Japan. 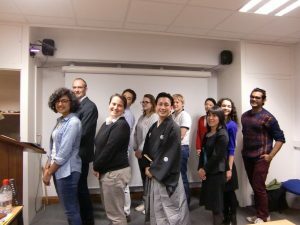 Ryuou gave a lecture at the Oxford University Oriental Institute to a selection of Japanese speaking staff and students. He explained the style of dance which involves fan, sword, singing and vocal work. 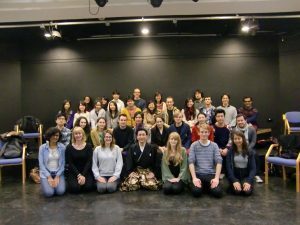 This was followed by a dance performance and interactive workshop in English, to a diverse audience with varying degrees of knowledge about Japanese arts. 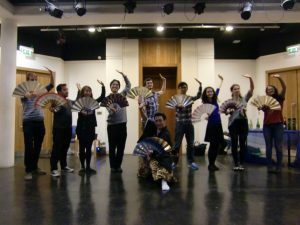 Ryuou demonstrated and described the meaning of the choreography, the stories behind the dances and how they relate to Japanese culture. He gave four excellent performances. The first two focussed on natural imagery, illustrating the aware(poignant) nature of winter and the beauty of Japanese spring time. During these routines Ryuou used his fan to depict a wide variety of themes from the tale of a young man out in the snow, moving forward to the arrival of the cherry blossoms in spring. The third piece was an energetic tale of battle, from preparation to the bloody battle itself. 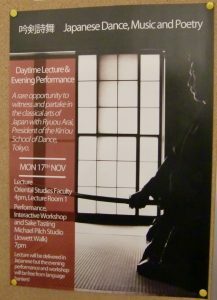 Ryuou-san used a sword to illustrate the differences between Kabuki, Noh and his own style of dance. Apparent within this interpretation was the thought provoking portrayal of the calm after battle and the hollowness of war. His last dance incorporated aspects of the three earlier dances and included fan, sword and singing. It did not disappoint as a climax to his performance and wowed the audience. Finally Ryuou-san taught the audience some basic dance moves following his dance style principles. Everyone embraced the opportunity to try out the moves they had seen performed and it was a fun conclusion to a very entertaining evening.